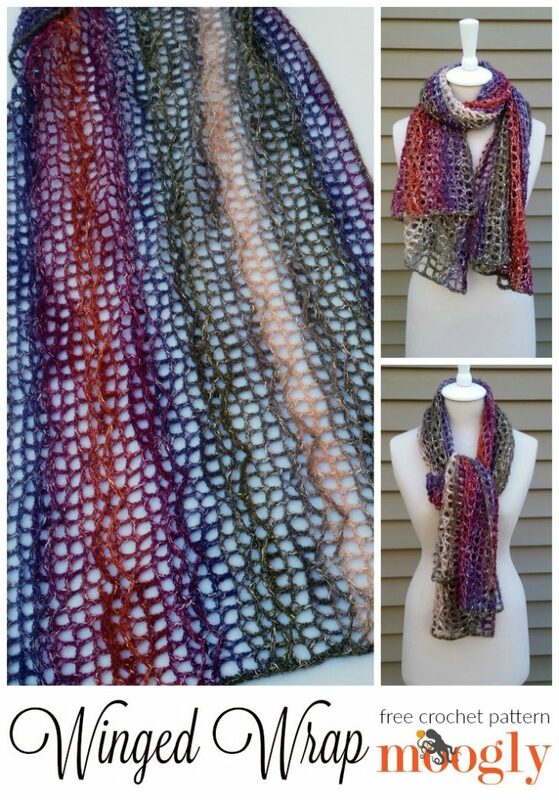 I had so much fun making this wrap this weekend! It’s just right for this in between weather. The yarn is warm, but the mesh is cool, and the “wings” in the stitches remind me of all the birds flying south. 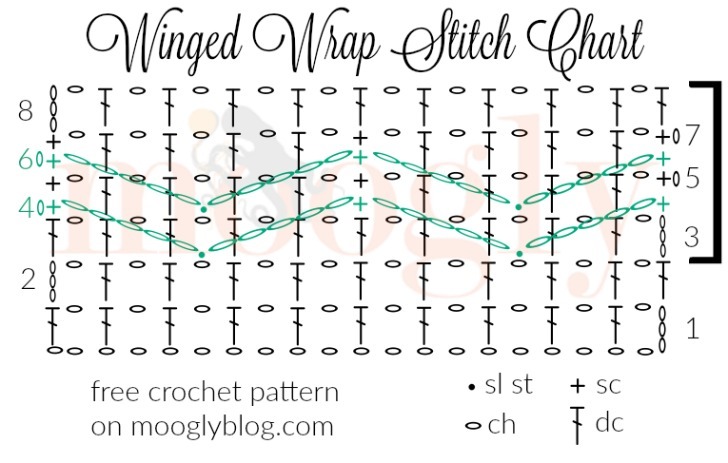 Here’s the free crochet pattern for the Winged Wrap! Remember when you were a kid, and you drew birds flying like very tired Vs? I know I wasn’t the only one! 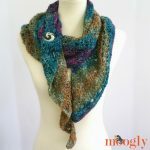 The subtle rows of wings in the Winged Wrap are like a flock of these birds hugging your shoulders, wrapping around your neck, or adding a splash of color to your next outfit! 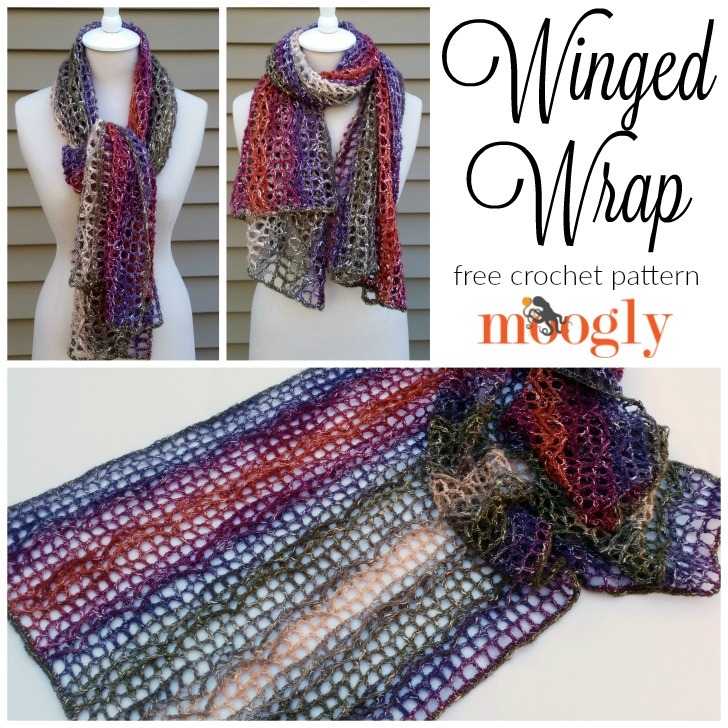 The Winged Wrap makes a wonderful layer, a fantastic gift, and a perfect comfort shawl. To change the length, chain a mult of 10 +4. To change the width, repeat rows 3-8 as desired. Skip all ch-1 sps unless otherwise indicated (the ch sp is only worked into on repeats of Row 4 and 6). 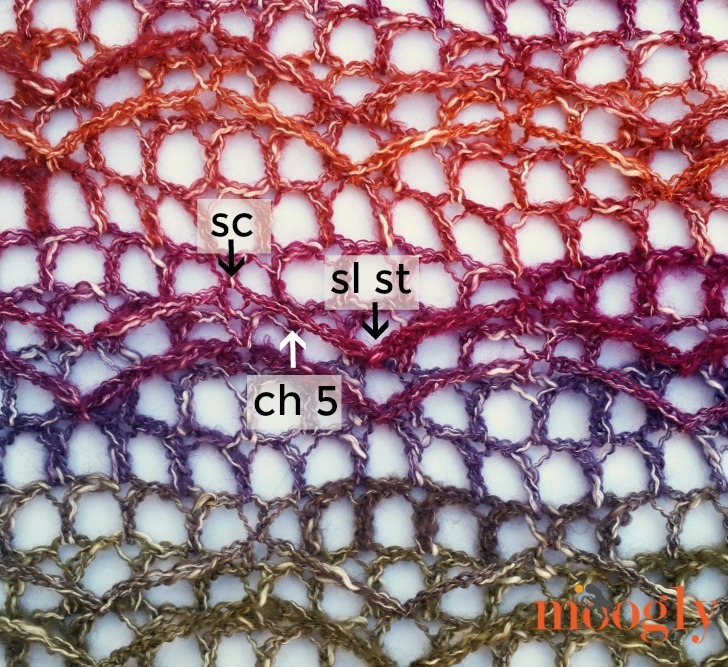 If you prefer to make this as a one skein pattern, skip Rows 51 – 56. Even rows are on the Right Side, odd rows are on the Wrong Side. Row 9 – 56: Repeat Rows 3 – 8. Row 57: Repeat Row 3. Edging: Sc evenly around, working 3 sc in each corner. Wet block. And that’s the Winged Wrap! I hope you enjoy making it – I can’t wait to see your versions! After I started designing this, Lion Brand also came out with Shawl in a Ball that **sparkles**! Oh my gosh! I can’t wait to make a Winged Wrap with built in bling! 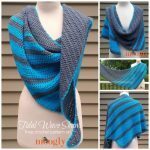 Any chance this pattern could be converted to knitting for a similar wrap? It’s beautiful but I’m not a crocheter! Hm, that might be a bit beyond my knitting knowledge I’m afraid. Perhaps? Would you consider a chart for this pattern? Hi Marian! I just put up a chart, maybe that will help? I just started my winged wrap last night. I’m hoping you might add one of your awesome videos because I’m getting stuck on row 5 too! 🙁 I’ll have to check out the chart more closely though. Maybe I can figure it out that way! Your final product is gorgeous! 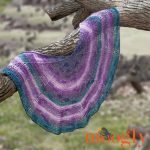 Thanks for another beautiful crochet pattern! Never mind!! I had some time to study the chart, and I got this beautiful pattern figured out. It was my own stitch count mistakes in the previous row that was making the worded pattern hard to work for me. This is so much fun to make! Thanks again. Oh well good! 😀 I’m so glad it helped! Hi DeDe! In Row 5 you are mostly working into the dc sts from Row 3 – the exception being the sc sts from Row 4. If you look at the chart at the bottom of the post above, you can see that the black Row 5 sts are worked into the black Row 3 sts and the green Row 4 sc sts. Does that help? I do hope to have a video tutorial up at the end of this month as well. I have tried to work through this pattern several times and I keep getting stuck on Row 5 as well. 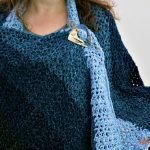 I ripped out and started from Row 4 again twice, and even though you have a stitch pattern I must be missing something…………..I have these loops on the back when I am working on Row 5 and it just doesn’t seem right! I would love a demo and hope to see it. I purchased some really nice merino/silk yarn and spent quite a bit! Hi Roberta! I should have the video up on the 30th of this month! When SC around the edge should I put a SC in each DC and in each ch 1 space across the row? Thanks! Thank you so much for this pattern! I hunted high and low to find one that “grabbed” me and yours most certainly did! As a bird lover I thought it was so cool of you to admit about making the “V”s as a child. I can’t wait to get started on this. Again, thanks. ♥ Thank you so much Barbara! I hope you enjoy making it! Hi! Thanks for the pattern…I am a beginner but I’ll give it a try. Greetings from Argentina to you!